Grandma, what Big Eyes you have! Stop your hunt, the WHITE WOLF MOVING MOUTH MASK is all you need for a realistic wild animal inspired look. Legends come to life with this illusive white wolf animated mask with scary sound effects! See VIDEO below. This white faux fur wolf head features intense light blue eyes that stare right into your intended victim's soul. 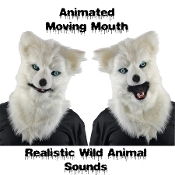 The movable mouth allows FURRY fans to talk that sly wolf talk. Just sit your chin comfortably in place and you will entice Grandma to come into your lair! The mouth moves when you move your mouth, creating the illusion of a real wolf! White wolf mask is made from molded plastic and covered in plush white fur with eerie blue eyes.